The best part of being a Manchester portrait photographer is being able to truly explore the local area whilst scouting unique locations for a new project. 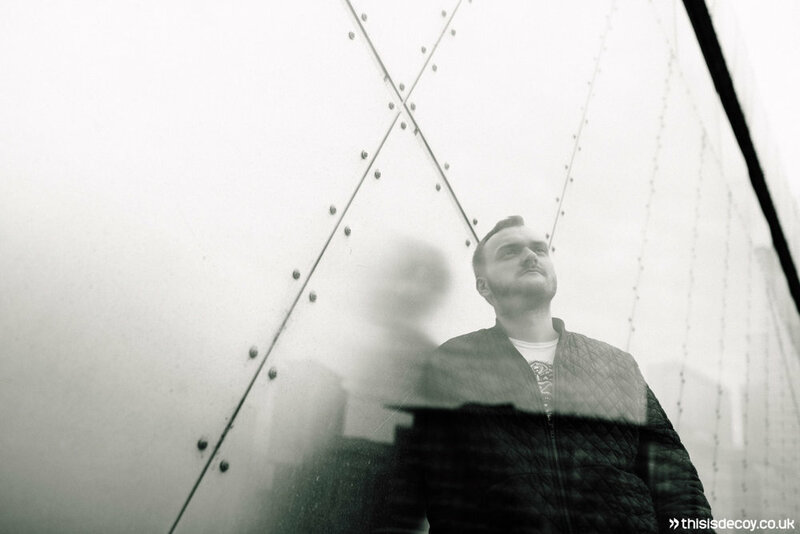 We were tasked by TJ Lawton, a Manchester based music producer and DJ to create a set of images to help promote himself online and to go in his new electronic press kit (EPK). 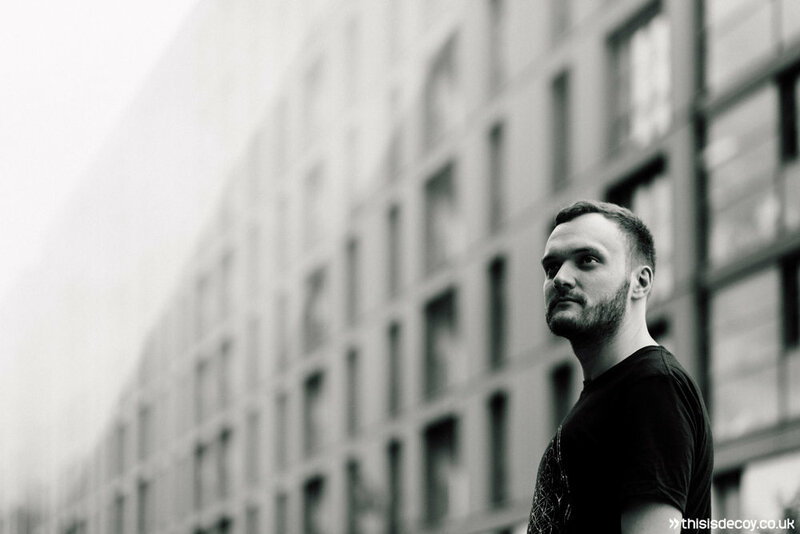 We started the Manchester portrait shoot by meeting with Tim and discussing a few ideas. It is incredibly useful as a professional photographer to get feedback on your ideas for a shoot like this, as well as taking some ideas from the client also. This ensures we are able to create a set of images that they will communicate their message well, all tie together as a collection of photographs and finally, that they will be happy with the results! We settled on the idea of using urban / gritty locations (that werenâ€™t too cliched - no graffitti). The main focus from a photography perspective was finding lots of textures to work with. Timâ€™s music is often labelled as cosmic and has a darker tone, this is certainly something we wanted to reflect in the imaging. A running style through most of the portraits is the use of a double exposure like effect, mixing the textures of the scene in a unnatural but unique and intriguing way. This style would have traditionally been achieved by exposing the same section of film one or more times. In recent years digital SLR bodies have a feature that allows you to do this in camera, mimicking the old film style. Although we use this function quite regularly for certain projects, we wanted to try something a more analog and tactile. All of the double exposure style effects on this shoot were captured using nothing but reflective crystals or panes of glass. The equipment we used on this shoot was a Canon 5D mkIII camera body, a Sigma 35mm f1.4 ART lens, a Canon 85mm f1.8 lens, a set of handheld crystal filters, a pane of glass and a trusty reflector. Overall we think the images work really well. They have a mystical quality to them thanks to the reflections and edit style. Our client was happy, and gave us this incredible review after delivery! To see more reviews by our clients please take a look at our Trustpilot profile. If you are in need of a creative portrait photography session, photos for an electronic press kit, artist press kit, dj press kit or a band photographer in Manchester or the North West please get in touch today for a no obligation quote. 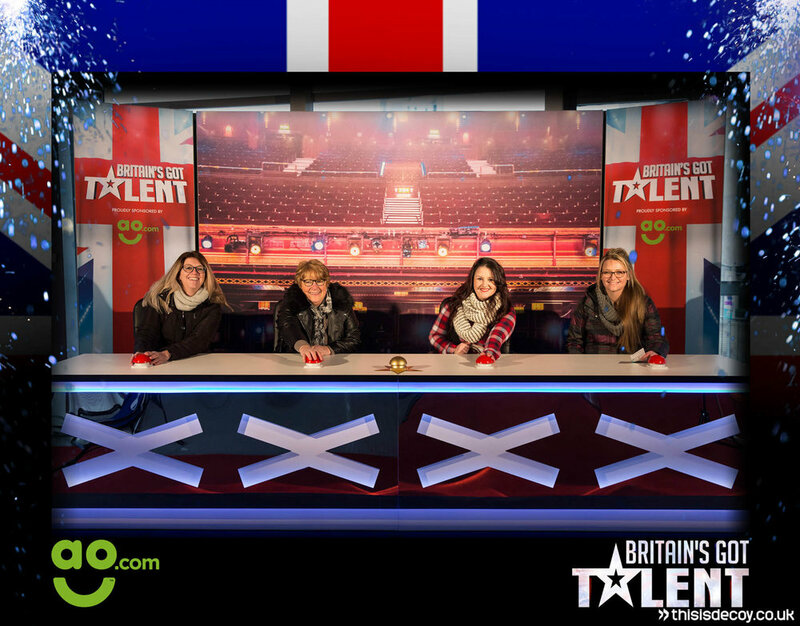 We were invited by Ear to the Ground to capture Britain's Got Talent fans getting involved with their experiential event that brought a sponsorship deal to life. 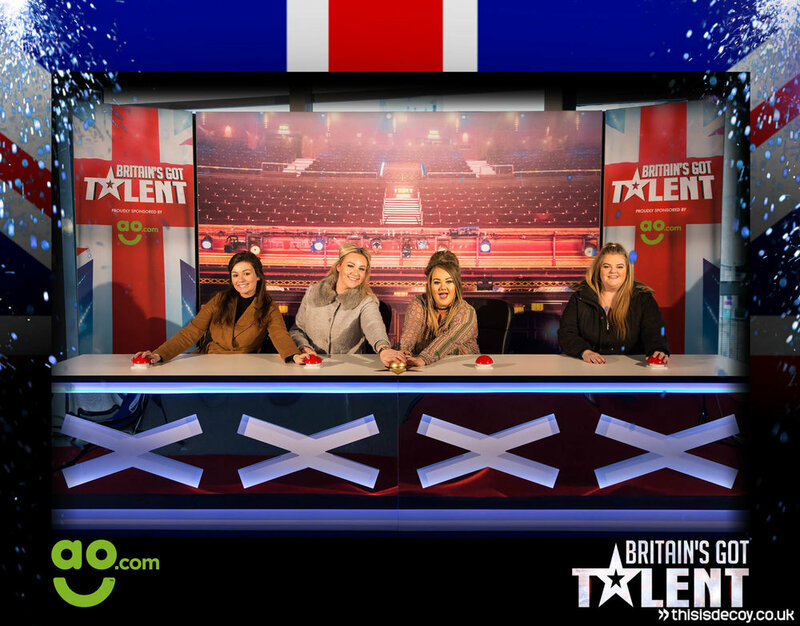 A mock BGT judges panel set was built in the foyer of the Lowry Theatre in Salford, during the initial auditions that took place in the main theatre. Fans were encouraged to take places on the set and pose for photos to be used on social media. The set was lit with 2x hired redhead lights, a Canon 5D mkIII camera with a 24-70mm f2.8 mkII lens. All secured in a in a fixed position on a Manfrotto tripod. All frames were shot via an infrared remote to keep the framing consistent, this ensured they were ready for the post production stage. The client wanted the images placing within the frame seen below. We apply watermarks and frames to images for our clients often, in this case the task was slightly more complicated, involving the use of Adobe Photoshop and spreadsheet data to place the image layered within the frame that was provided. Everyone enjoyed the experience on the day, including us and the fans. Activations like this form a key part of alternative event marketing and we enjoyed filling the role of a Salford PR photographer. Our client was happy with the results and we think the images look great! They were delivered next day by digital download to be uploaded ao.comâ€™s social channels. If you require a professional photographer in Salford or Manchester to create PR content or capture a similar experiential event get in touch with us for a no obligation quote.